It’s February. For a Midwestern woman who readily admits to some degree of seasonal affective disorder–SAD, this month is a mixed blessing. It does mean spring really is coming soon, but February often brings some very cold weather and temperatures that are perfect for depositing ‘WAY too much snow. This winter the temperatures have been milder than usual, and the snowfall has been less than usual, but both have demonstrated some attention-grabbing extremes, and sometimes the wind has been brutal and relentless. I’ve had more difficulty forcing myself to go out than ever before. Our younger daughter gave me an amaryllis bulb for Christmas–my first ever. In all candor, I’ve never really been a fan of amaryllis; but because it was from her, I carefully read and followed the instructions on the box–and watered and waited and watched. 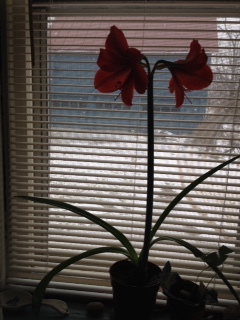 Last Tuesday when I went to the window in the living room for its twice-a-week watering, it had two giant red blooms! I immediately moved it to the kitchen window, where I can see it more often. It makes me smile. The ground may be covered in snow outside, and we may be under yet another Winter Weather Advisory for 24 hours beginning this evening, but the flower on my windowsill is demonstrating that blooming is possible anytime of the year–if you get a little devoted attention, a little appropriate and timely sustenance, and a whole lot of light. ‘Sounds like a good prescription for a SAD woman who just needs to bloom where she is, doesn’t it?